Known for his work with jazz royalty and the King of Pop himself, Bruce Swedien is a studio legend. Now in his 80s, he first found success for his studio work on 1962's "Big Girls Don't Cry" by Frankie Valli and the Four Seasons, which earned him the first of 14 Grammy Award nominations (of which he has won five). His work at Universal Recording studios in Chicago would also see him record jazz greats like Count Basie and Duke Ellington. But it was Swedien's studio partnership with fellow Universal alum Quincy Jones that would result in his most memorable recordings. Jones and Swedien oversaw Michael Jackson's most successful albums—Off The Wall, Bad, and Thriller—which between them have sold well over 150 million copies. Thriller itself is the most successful recording in history, and so it is perhaps understandable that it is Swedien’s favourite. "Well, I'm grateful, deeply grateful, to have been a part of it and to have met Quincy in Chicago then," Swedien says of that album and his enduring relationship with Jones. Part of the success of that partnership comes from Jones' admiration for the way in which Swedien recorded Jackson's work. "I developed a thing called the Acusonic Recording Process," Bruce explains. "Quincy wanted a name for the process that I used when I recorded Michael's stuff, because what I did was record all of the tracks analogue first. Digital recording was available and we were all quite impressed with its clarity, but if you start the music in digital you can never go back to analogue and it won't sound as good." "The sound of pure analogue 24-track, 2-track, or even mono is very warm and musical," he continues. "It captures music with great realism. So I recorded it in analogue, but took it a step further. I decided to use all of the analogue tracks in pairs to create stereophonic recordings. "Every sound source in those recordings is recorded on two tracks in real stereo, like the Blumlein technique [where two bi-directional microphones are paired together and angled at 90° to create the stereo image], which I use a lot of in my work." Bruce reveals some of the equipment he used on the Jackson recordings and still favours to this day. "Originally, in 1952, I bought two Neumann U 47 tube mics. One of them was stolen, but I still have the one of them that I first recorded Michael singing Charlie Chaplin's ‘Smile’ with. Michael said that ‘Smile’ was his favourite piece of music in his life. He loved that song even more than his own and wasn't afraid to say that." "Oh, the U 47," he says without hesitation. "But, you know what was also a great microphone? The Shure SM7—the original one—not the SM57. That is another matter. They are located in Chicago, and I worked closely with them. The SM57 is an OK microphone, but it's nothing like the SM7." Bruce then offers an insight into his current setup. "I don't use plugins," he says. "I haven't found any that sound great. I'm fortunate to have all the original microphones, gear, and equipment. 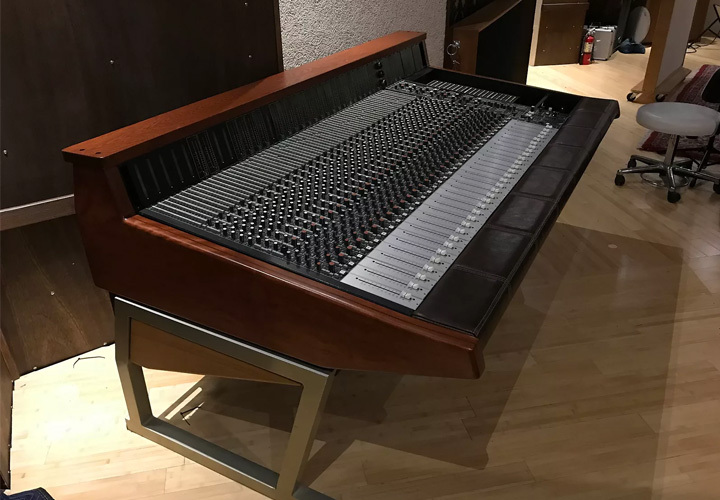 I have a complete Pro Tools system, and I'll use the gates and so on to clean up tracks that may have a little bit of doo-doo on them, but no more than necessary." Swedien continues, "I have Teletronix compressors and so on and don't really need the plugins, although the ones that Bill Putnam Jr. was involved with sound superb. I have 1176s, which I will use, and they and the Teletronix can sound pretty decent when not overused. I have a 32-input Harrison desk. It's a little difficult to keep it functioning properly all the time. We named it Harriet—it can be a pain." "I was very fortunate to be in the right place at the right time," he continues. "My mentor was Bill. [Fellow producer/engineer] Allen Sides and I are the luckiest guys in life to have met Bill Putnam. Boy, oh boy, what a man. He was just incredible. And I got to work at his gorgeous studio in Chicago—a big studio, huge place, and I recorded Count Basie and Duke Ellington. It was an incredible life. That studio is sadly a clothing store now…"
As well as explaining how his Acusonic Recording Process can bring breadth and depth to a recording, Bruce also offers a couple of insights into how to capture the perfect vocal—the second one being easy: switch your lights off. Another thing I learned from Michael is he always sang in the dark. He never had a light on. His feeling, and Quincy has always agreed, was that the light is very distracting." "Have you heard of a company called Acoustic Sciences?" he says. "They make TubeTraps [bass traps], and I'm a big fan of them. When I do a vocal I will always surround the vocal mic with TubeTraps and have the vocalist sing in that environment. Michael did and he absolutely loved it. Another thing I learned from Michael is he always sang in the dark. He never had a light on. His feeling, and Quincy has always agreed, was that the light is very distracting. Michael always memorised his vocals too. Always—I don't mean once in a while—I mean every one." Bruce is still passing his expertise on at Full Sail University in Orlando, where he speaks at seminars. "I get the chance to meet some of the most interesting young people there and can frequently see myself in them," he says. "And they all know about Michael, every detail about him, which I find very interesting." And he has some parting words from Quincy Jones that we can all take heart from: "You know what Quincy says? Now think about this. He'd say, 'Music is the only true magic in life.’"